Dr. Mark Richards, a plastic surgeon in Washington, DC, recently returned from lecturing to the 4th M.E.G.A. Hand International Symposium and the 7th European Masters in Aesthetic & Anti-Aging Medicine Conference in Paris, France. As one of the pioneers of minimal incision arm lift or minimally-invasive brachioplasty (MIB), as well as optimal treatment of menopause with testosterone alone, Dr. Richards’ speaking topics covered performance of the MIB procedure as well as the need for testosterone for anti-aging and the anti-inflammation needs as men and women age. At the recently held 4th M.E.G.A. 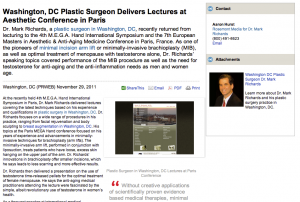 Hand International Symposium in Paris, Dr. Mark Richards delivered lectures covering the latest techniques based on his experience and qualifications in plastic surgery in Washington, DC. Dr. Richards focuses on a wide range of procedures in his practice, ranging from facial rejuvenation and body sculpting to breast augmentation in Washington, DC. His topics at the Paris MEGA Hand conference focused on his years of experience and advancements in minimally-invasive techniques for brachioplasty (arm lifts). The minimally-invasive arm lift, performed in conjunction with liposuction, treats patients who have loose, excess skin hanging on the upper part of the arm. Dr. Richards’ innovations in brachioplasty offer smaller incisions, which he says leads to less scarring and more effective results. Dr. Richards then delivered a presentation on the use of testosterone time-released pellets for the optimal treatment of female menopause. He says the anti-aging medical practitioners attending the lecture were fascinated by the simple, albeit revolutionary use of testosterone in women’s health. Dr. Mark Richards received his undergraduate degree with honors from Yale University and his medical degree from the University of Maryland School of Medicine. He is board-certified by the American Board of Plastic Surgery. Dr. Richards dedicates a large portion of his time each year to continuing medical education. He has been recognized by the Consumer Research Council of America’s Guide to America’s Top Surgeons for the past ten years and has published several articles in the Aesthetic Surgery Journal concerning his innovations in minimally-invasive arm lift and high-volume liposuction. Located at 11300 Rockville Pike Suite 912 in N. Bethesda, MD, Dr. Richards’ practice can be contacted at (301) 468-3458. He can also be reached online through the website plastic-surgeon.us or facebook.com/drmarkrichards.